I just finished teaching a fabulous breakfast menu last month and these pancakes were a favorite! I received a lot of great feedback from moms who made these for their kids and had success with even the most finicky eaters. These pancakes check off all the important breakfast boxes for me: protein, good fats, fiber/complex carbs. I talk a lot about these three macro nutrients in my breakfast class every year to help answer the question, “what constitutes a good breakfast?” I actually have no problem with any food for breakfast – soup, leftovers, a smoothie, a sandwich – provided it has all three of the above. The goal with my breakfast food is to fuel my brain, provide long-lasting energy until lunchtime, and keep my blood sugar stable. If you haven’t noticed, I’m on a bit of a grain-free kick lately, especially for breakfast. 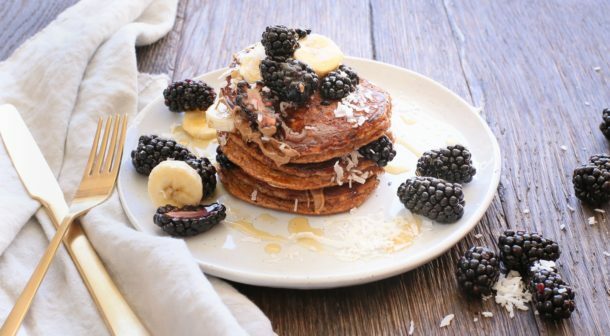 So many grain-free recipes are higher in protein which can be hard to come by in the morning. 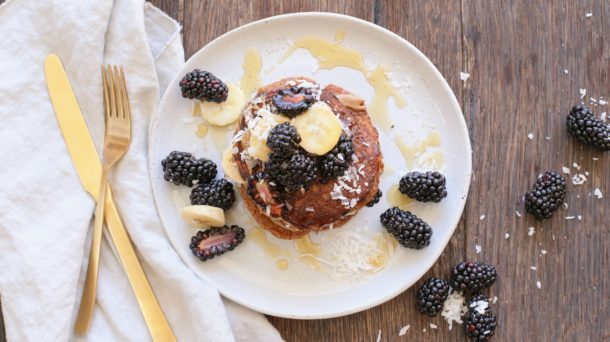 These pancakes are full of almond flour and more eggs than a normal pancake batter. 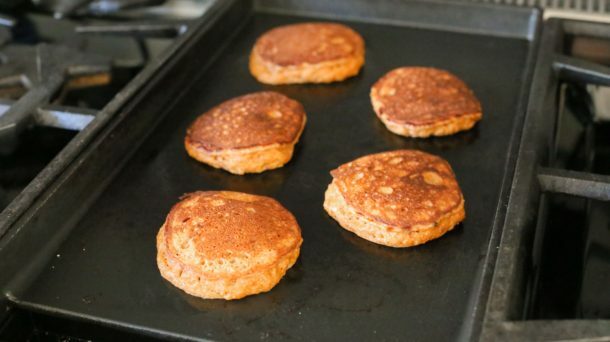 Another reason I am so fond of grain-free recipes is that the baked good (or pancakes in this case) lasts so much longer in the refrigerator with no loss of moisture. I have eaten the pancakes straight out of the fridge several days later (I was hungry!!) and I thought they were fantastic. 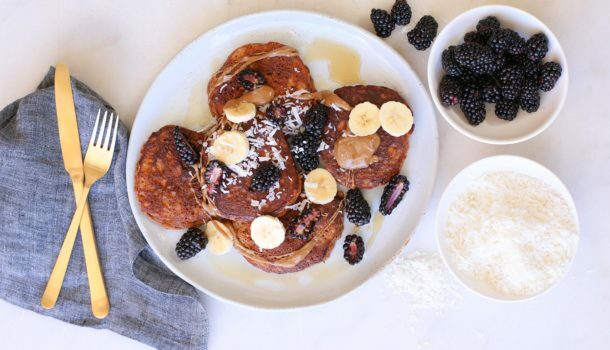 But these pancakes are packed with even more than protein, fiber and good fats, they’re also loaded with sweet potato power — tons of carotenoids and antioxidants! For those of us who live at the beach or in warmer climates where we are exposed to the sun more, we need carotenoids ( a powerful class of phytonutrients found in dark orange and yellow produce) to help protect our skin from sun damage. I am a huge sweet potato fan and I have been saying for the last year — sweet potatoes are the new cauliflower! They are so versatile and downright delicious, plus so nutrient-dense. Sweet potatoes can go both sweet and savory. They puree beautifully and can be spiralized, shredded, roasted, grilled, sauteed and steamed. And there are so many amazing varieties. My favorite is the yellow one — like candy! Some helpful tips with this recipe: you must use soft, cooked sweet potato in this batter, so plan to cook the sweet potatoes a day or two ahead. Also, the batter is thick, so try and spread it out a little when you spoon it onto the griddle. It is a heavy batter, so if you plop it on and it’s too thick, it will take forever to cook through. So why do I recommend separating the eggs if I don’t end up whipping the whites to soft peaks? Because adding the unbeaten whites in the last step actually helps to give some lift to the batter. It’s a really cool technique that I also included in the lemon ricotta pancake recipe. Many of you have kids who are out of school or finishing up soon. So many people tell me they have more time to cook when school is out, especially in the morning. Here you go – no excuses! In a medium bowl, combine the egg yolks, mashed sweet potato, coconut flour, almond flour, cinnamon, nutmeg, baking soda, vanilla extract, salt, almond milk and maple syrup until well-combined. Stir in the egg whites until blended. Lower the heat to medium-low and brush with coconut oil. Spoon 2-3 Tablespoons batter onto the griddle, using the back of a spoon or a spatula to spread it about ¼” thin. IF THE PANCAKE IS TOO THICK, IT MAY NOT COOK WELL IN THE CENTER. Cook for 4-5 minutes per side, until golden and cooked through. *For this recipe, I like to wrap the sweet potato in unbleached parchment paper, then aluminum foil and roast on a baking sheet at 400 degrees until super tender. This can take 45-90 minutes, depending on the size of the potato. 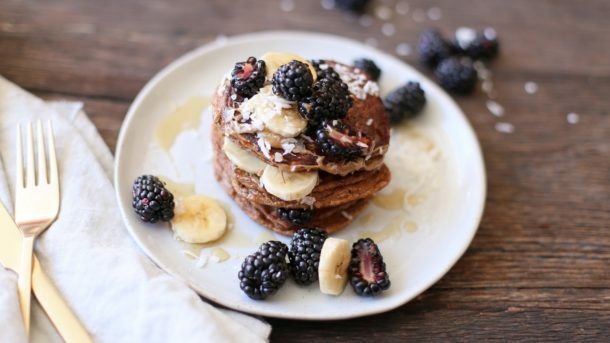 These pancakes are amazing and so easy to make! Felt good feeding my 3 yr old a healthy pancake to start his day! My family is LOVING these pancakes. I’ve already made them 3 times since taking Pamela’s class.